Hello, I'm Sean Glumace, graphic & web designer, WordPress designer and instructor. Sean Glumace has been the web designer for Golden West College the past 5+ years; and has been responsibe for redesigning and relaunching the main campus site, maintaining over 15 campus sub sites and building new sites using WordPress. Sean has also been a graphic designer for 16+ years, designing everything from in-store displays and signage for supermarkets such as Ralph’s, Whole Foods and Stater Brothers, to e-commerce auction sites for online consumer electronics companies. Sean's career also included a stint as a web/graphic designer and then art director for McMullen Argus Publishing (Primedia); my responsibilities included building and designing sites for Lowrider Magazine and Super Chevy, and 30 other automotive magazine sites. 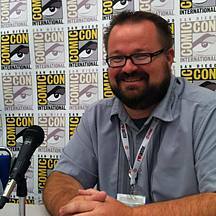 Sean Glumace also has been a Digital Arts Instructor at Golden West College for over ten years. He has taught thousands of students how to master WordPress, and Adobe programs such as Illustrator, InDesign, Photoshop, Dreamweaver, QuarkXpress, as well as Mac OS software in the classroom and online. Throughout Sean's teaching career he has maintained a freelance graphic design business, with clients that have included the Academy of Television Arts & Sciences (Los Angeles Area Emmy Awards), Image Comics and other companies worldwide. Responsible for maintaining over 120 Macintosh G5 systems software and hardware in the Macintosh labs including: workstations, Xserve file server and printer server, printers and scanners. The labs were utilized by over 700 Digital Arts students each semester. Assisted users (instructors and students) in the Macintosh labs with design questions and troubleshooting including all software in the labs. Responsible for marketing the Digital Arts department which includes all print design, web design and community outreach. Designed and currently update the department website at www.gwcdigitalarts.com Maintained records for purchases, upgrades, installations and inventory Responsible for writing and presenting federal and state grants for department hardware and software. Requested and received 4 Vocational Education (VETA) grants (all $30,000+) over 4 years. Designed and implemented consumer electronics e-commerce website for Spidergear, including back- end support database with Filemaker Pro Planned and executed daily product specials, sales and promotions for the main site as well as Ebay, Amazon.com Auctions, Yahoo Auctions and Classified2000.com Managed 3rd party fulfillment accounts Managed daily front office operations including office to shipping warehouse communication. Responsible for custom signage solutions for use in food and grocery industries which included clients such as Ralphs, Vons, Bristol Farms, Pavilions, Whole Foods, and Lucky's. Responsible for developing all production film for silkscreen printing using stat camera and dark room. Redesigned the main Golden West College web site at http://www.goldenwestcollege.edu Responsible for monthly maintenance of all campus web sites. Designed and launched new campus sites in WordPress. Identified weekly website problems, diagnosed causes and determined corrective actions. Discussed client requirements and scheduling to outline basic presentation concepts and coordinate creative activities. Played an active role with marketing and sales to provide artwork as needed for web and print. Current and past classes include: DA174 Desktop Publishing with Adobe InDesign DA178 Introduction to Web Design DA176 Desktop Publishing with QuarkXpress DA177 Graphic Design Principles/Portfolio Class DA135 Introduction to Adobe Illustrator DA200 Advanced Web Design.